Size: 4″ (100mm) body + 1″ (25mm) antennae. Three shrimp per pack. NEW COLORS COMING IN 2018. Current stock is limited to Fathom Green. All other colors are sold out. Good for many saltwater species and also for both largemouth and smallmouth bass. 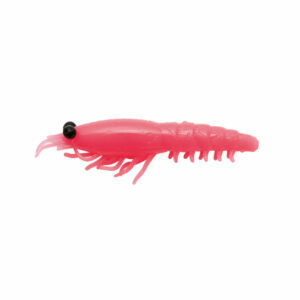 Nikko’s largest shrimp is modeled after & scented with the real thing! Made with the same super soft and tough Nikko material, this bait will take plenty of abuse. Abdomen can be snipped to shorten bait length if desired. Eyes fluoresce in UV light. Naturally scented. Just stretch to refresh. No messy liquids. Will not harden or dry out. Will not harm fish or other sea life if ingested.